Infant chorioamnionitis (or intra-amniotic infection) is an infection of the membranes which surround the fetus in the uterus as well as the amniotic fluids. It occurs in approximately two percent of births, and when detected and treated in a timely manner, there are usually no long-term complications for the mother or her baby. As a result of this reassuring fact, doctors and nurses can sometimes drop their guard when facing this infection. Infant chorioamnionitis is a serious condition which demands vigilance and immediate treatment. The consequences of failure to treat this infection can cause an injury to the child's brain. What is Chorioamnionitis in Pregnancy? Infant chorioamnionitis is characterized by the inflammation of fetal membranes and/or amniotic fluid due to bacterial infection. The two membranes which may become infected are the Amnion (or inner membrane, which touches the amniotic fluid surrounding the fetus) and the Chorion (or outer membrane, which is the closest to the mother and supports the Amnion. If diagnosed and treated promptly (usually with antibiotics) recovery is usually quick, but if the infection develops and spreads without proper treatment it can have numerous severe consequences. As with any infection, the proximate cause of chorioamnionitis is the growth and spread of harmful bacteria. The risk of this condition developing increases with prolonged labor, as well as a premature rupture of the amniotic sac ("water breaking") prior to delivery, higher numbers of vaginal examinations in the final month of pregnancy, Group B strep, a short cervix, and/or urinary tract infections during pregnancy. What are the Signs and Symptoms of Chorioamnionitis? What Kind of Complications can Arise From Chorioamnionitis? Complications for your child can include sepsis, respiratory problems such as pneumonia, and meningitis (infection of the spinal cord and brain). Chorioamnionitis is also a risk factor for the development of brain complications such as cerebral palsy, periventricular leukomalacia, and premature birth. Other complications which can develop include villitis, hypoxic-ischemic encephalopathy (HIE), funisitis, hydrops fetalis, and intrauterine growth restriction (IUGR). Although some of these conditions - such as funisitis and villitis - are usually benign, they can increase the risk of stillbirth and fetal death. Due to the risk or presence of these complications, Chorioamnionitis may also warrant neonatal intensive care admission. It is important to note all of these infections are more likely to develop and become fatal for premature babies. However, in these cases the risks are still relatively rare, with around 15% chance of brain complications and a 10-20% chance of developing pneumonia. Unfortunately, in the most serious of cases chorioamnionitis can result in stillbirth. Although if promptly diagnosed and treated this will only rarely happen, in some cases such as when chorioamnionitis occurs earlier in pregnancy and is asymptomatic, stillbirth can be more likely. In addition, the risk of stillbirth may be increased by the development of complications such as funisitis, the infection and inflammation of the umbilical cord. Although Chorioamnionitis does not usually result in stillbirth, it is one of the most common causes of stillbirth, with one study finding 37% of stillbirths were linked to the condition. What is the Treatment for Chorioamnionitis? Treatment for Chorioamnionitis typically involves the prompt administration of intravenous antibiotics, which have a high rate of aiding successful recovery in cases such as a group B strep infection. In other cases, treatment may require immediate delivery of the baby. Either way, antibiotics are commonly prescribed for both the mother and her child after delivery as well, usually for a day or two. Supportive measures such as the use of acetaminophen (Tylenol) can also be particularly important during delivery to help prevent the occurrence of brain damage. Is there an increased risk that if the mother has chorioamnionitis the child will be born with cerebral palsy? If a mother has chorioamnionitis as an infection in the placenta, there is much as ten times greater risk that the child will be born with some type of cerebral palsy. What is the Difference Between Histological Chorioamnionitis and Clinical Chorioamnionitis? If there is a diagnosis of chorioamnionitis based on the mother or child's symptoms, it is clinical chorioamnionitis. Histological chorioamnionitis is diagnosed from looking at the placenta. So if the mother does not have any symptoms but the doctors later the put the placenta and look under the microscope and they find chorioamnionitis, that's histological chorioamnionitis. What are the ACOG Recommendations for Treating Chorioamnionitis? The American College of Obstetricians and Gynecologists (ACOG) is an educational resource to aid clinicians, and also has made access to its recommendations available online. 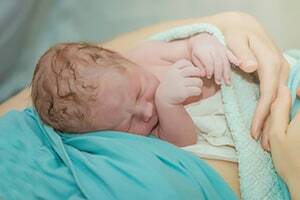 Regardless of institutional protocol, when obstetrician-gynecologists or other obstetric care providers diagnose an intraamniotic infection, or when other risk factors for early-onset neonatal sepsis are present in labor (e.g., maternal fever, prolonged rupture of the membranes, or preterm birth), communication with the neonatal care team is essential to optimize neonatal evaluation and management. That ACOG Guideline relates to expectant management following premature rupture of membranes. It does not specifically address either (1) the criteria for a clinical diagnosis of chorioamnionitis or (2) the intrapartum management of a patient who meets the clinical diagnosis of chorioamnionitis. ACOG has also compiled a table of common antibiotic choices which you can view here.